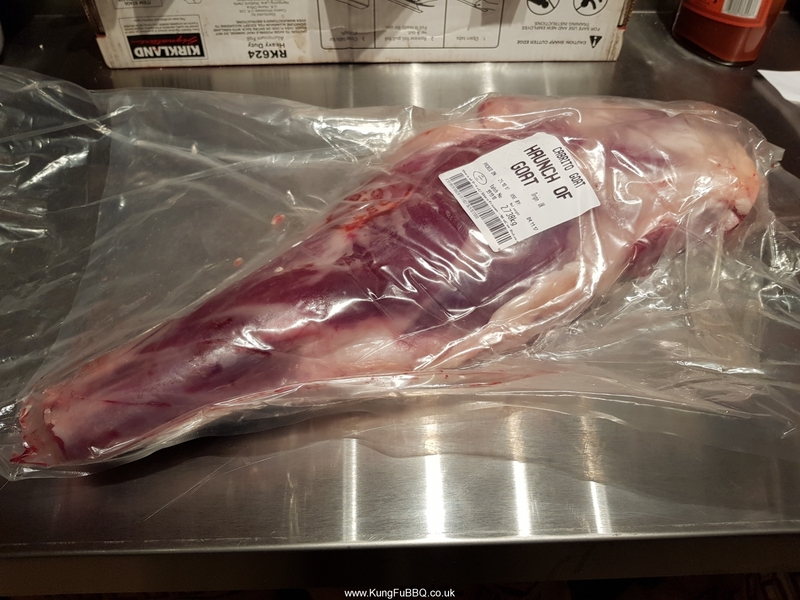 I bought half a goat from Turner and George last year, they don’t have it listed this year so I bought it direct from Cabrito Goat for £120 – Why half a goat? 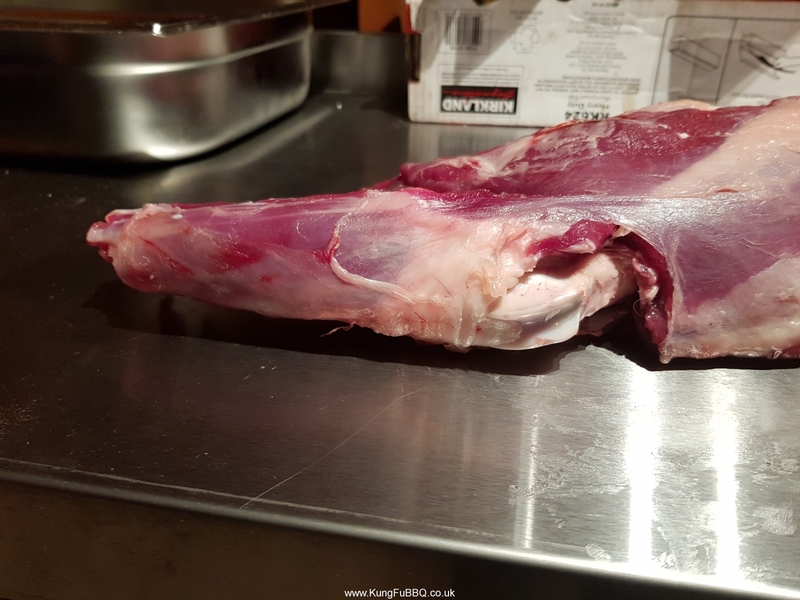 I wanted to cook a few dishes and if the leg is £40, shoulder with neck £54 (£36 for just the shoulder) then I felt £120 for half a goat was good value for money overall as you would get a few extra cuts out of it and a chance to try and butcher/cut it myself. 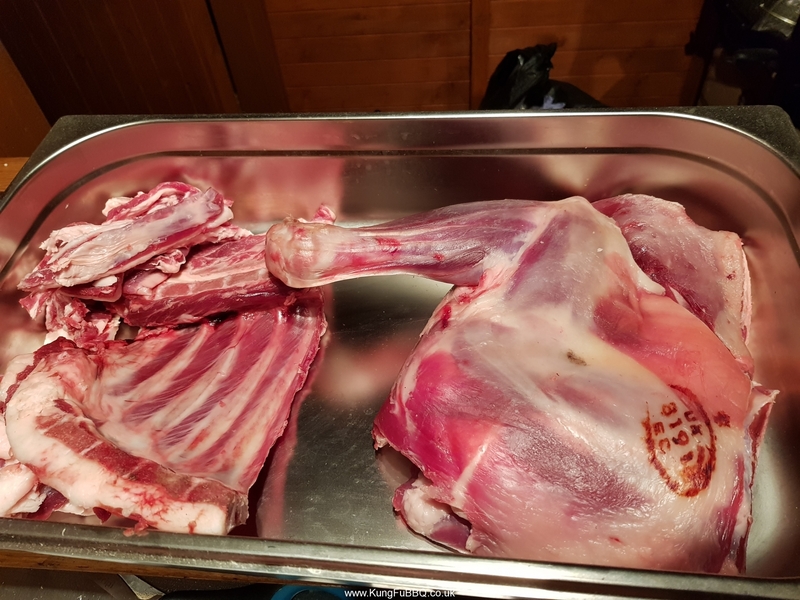 The meat arrived in 3 sections: Haunch, Shoulder and Middle. I was cooking the leg first so started with the haunch. 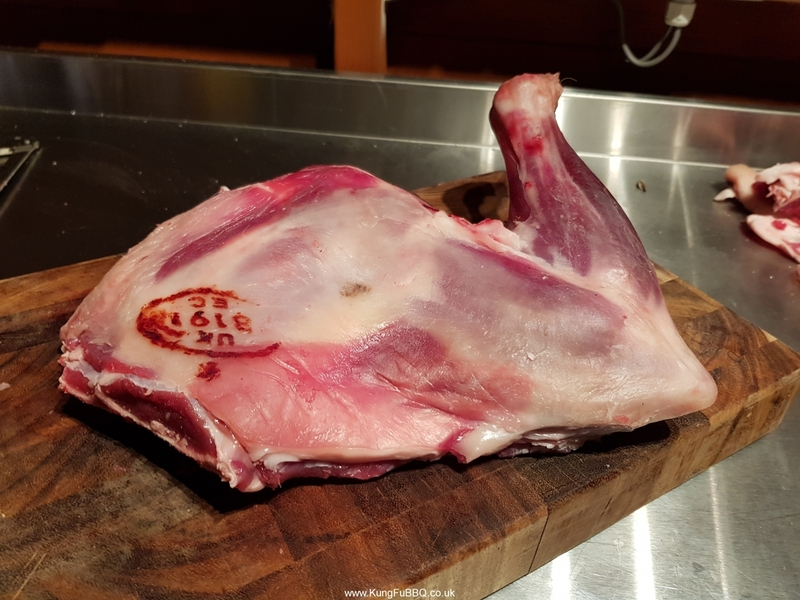 There aren’t a lot of goat butchery videos online but the master of butchery online is Scott Rea who I have mentioned a few times in the past, I have learnt a lot from his videos and as he has a video on how to butcher a whole lamb I thought goat would be kinda similar and should help! I watched the video a few times then took my laptop out to the hut so I could follow the steps. 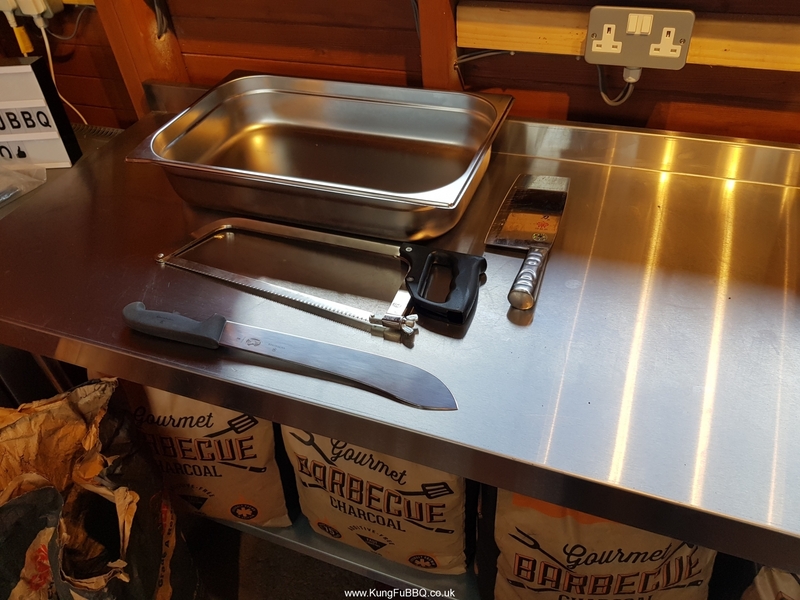 When I moved into the BBQ Hut I bought a couple of stainless steel tables from Nisbets. 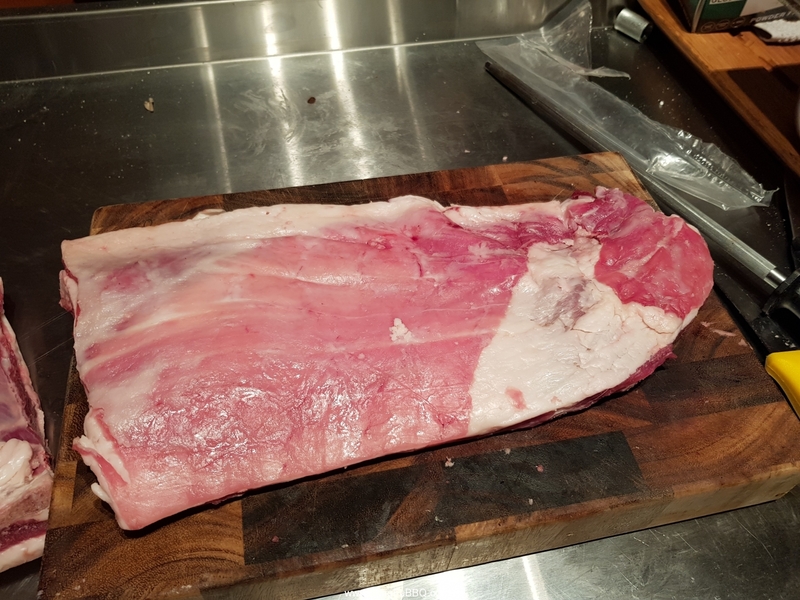 I put the Haunch on my worktop. Then removed it from the packaging. 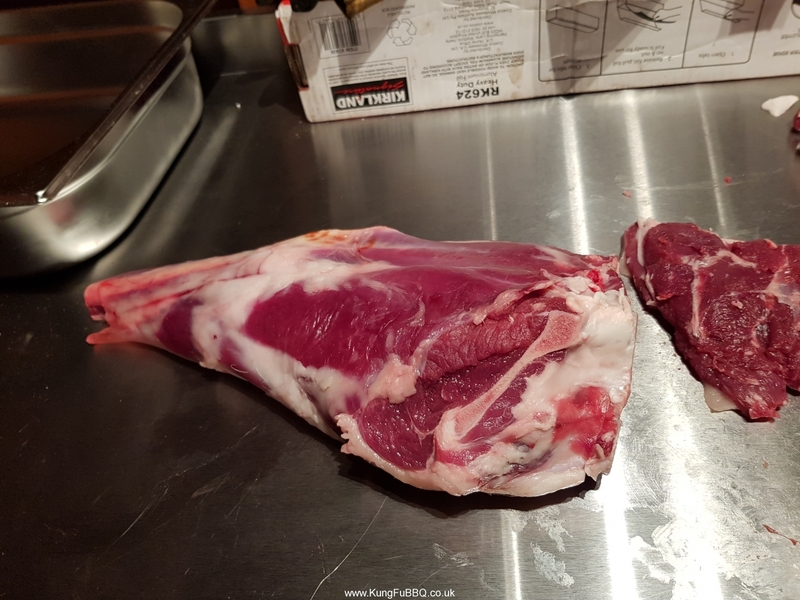 You can see the shank on the left, the leg in the middle and to the right of the aitch bone under the section of fat is the chump (sometimes called the rump). The fat above the chump came off easily by hand. I marked the leg with my knife about a thumb width away from the aitch bone at the top and bottom. I sliced in with my butchers knife until I hit bone then I used the saw to get through. 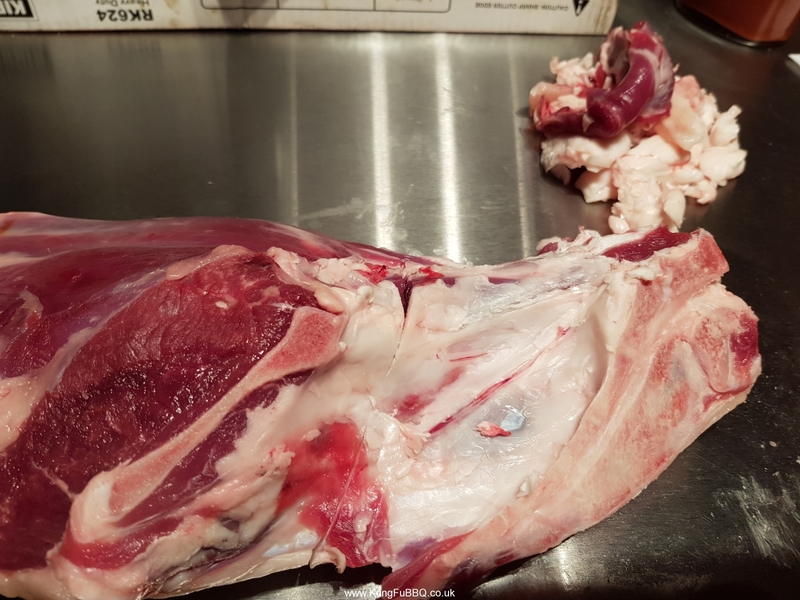 Next I cut into the knee joint to expose it and scraped around the bone area to release the meat from the bone. On the other end of the bone I tapped the knife along the bone until there wasn’t a bone sound. 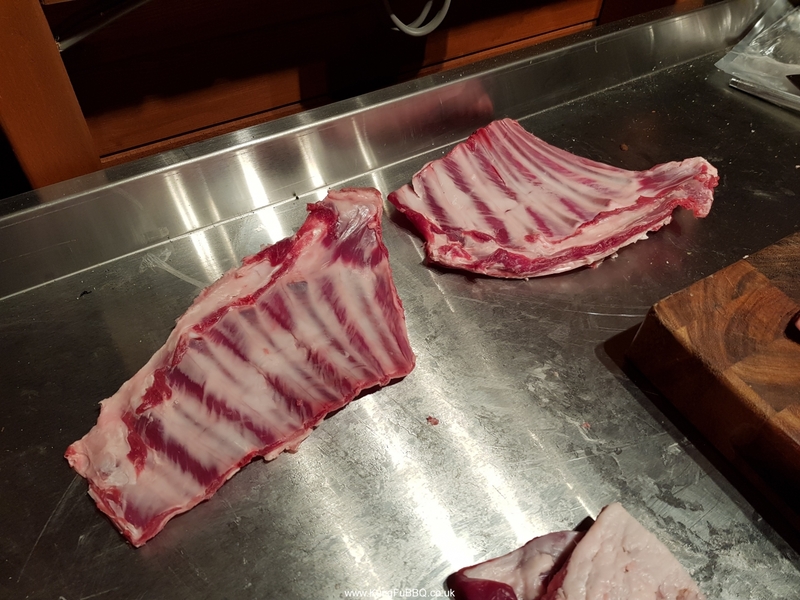 At this point I cut in with the knife and again released the meat from the bone by cutting with the tip of the knife and scraping the bone. Once everything was fairly clear I grabbed the shank and twisted it round and round until it came loose and I pulled it through the meat. 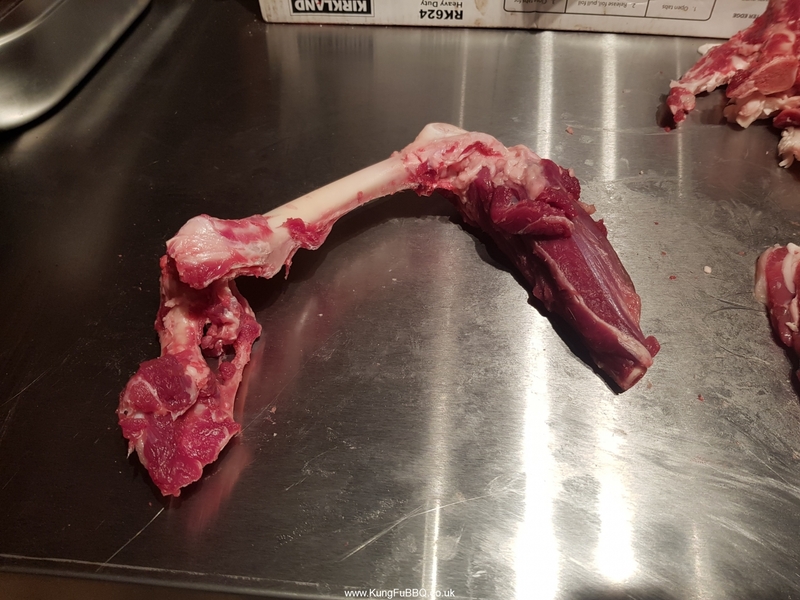 This left a deboned leg of goat. You can see some natural seams which I cut into to unroll the leg. 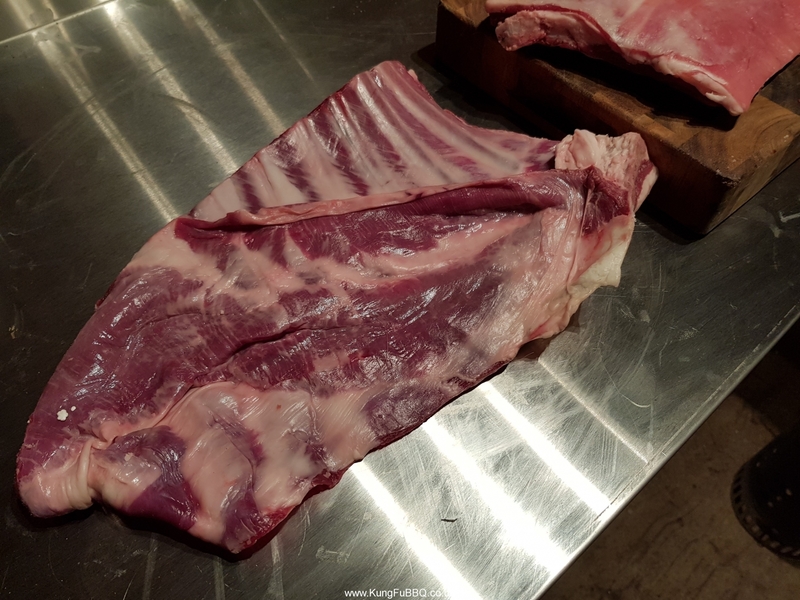 I unrolled the meat and started slicing into the thicker sections to flatten it out a bit. That was it for the leg. It probably sounds harder than it is, Scott’s video is a massive help so I would recommend that and I would have no concerns deboning and/or butterflying lamb or goat in future. The chump will get grilled at a later date. 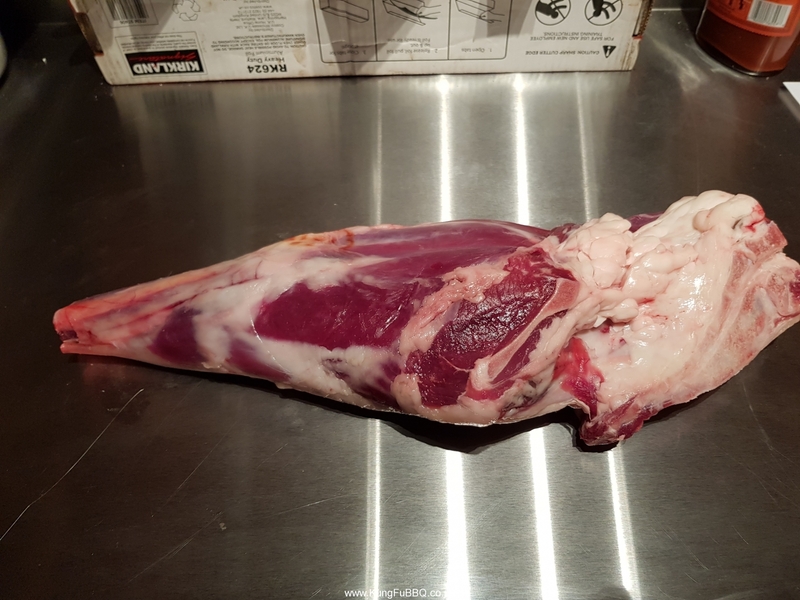 From the photo below you can see the neck at the bottom, the shoulder and a shank. From the other view you can see where the shoulder and middle ends were cut. I started by cutting the neck off using the butchers blade and a quick saw. 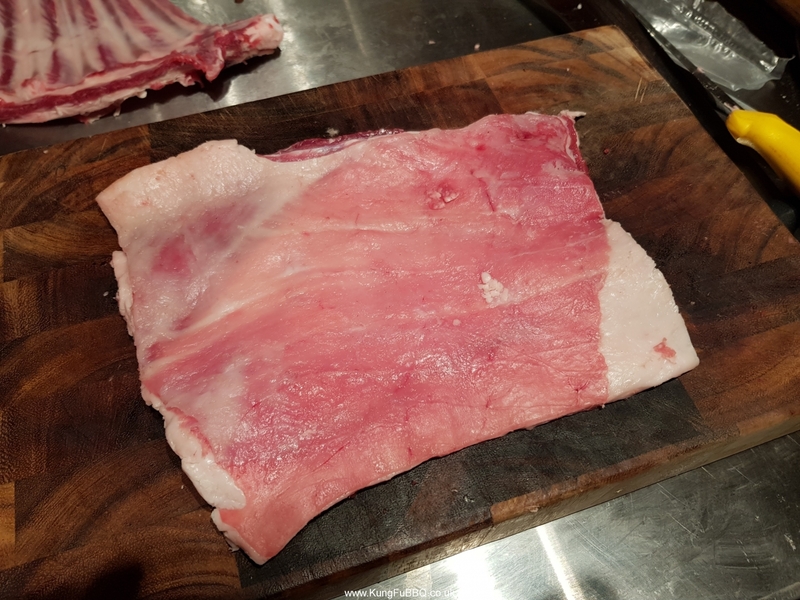 I then flipped the shoulder round and removed the bone section from inside the shoulder. This came away quite easily and I used the tip end of the knife to work it away from the meat. 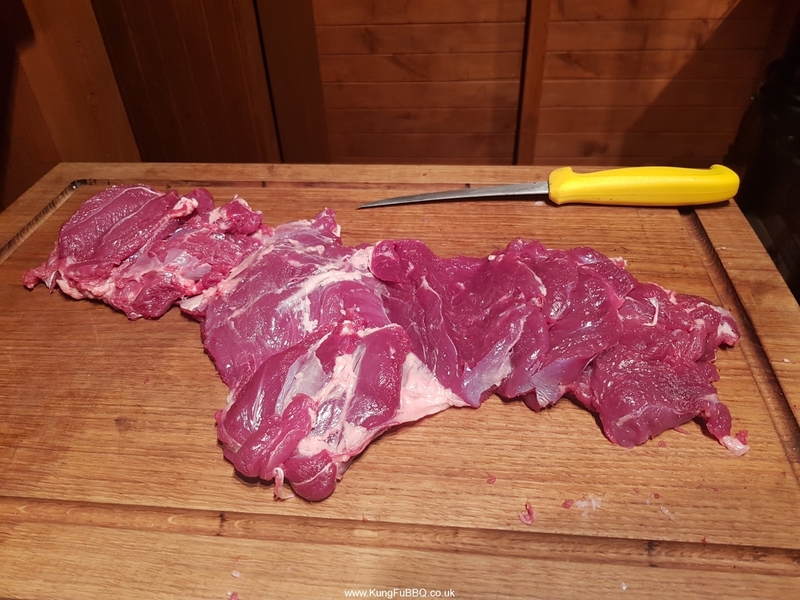 The middle was in 2 pieces – the breast and the belly. I trimmed the belly trying to make it into a nice shape then removed the bones. I also removed the bones from the breast and rolled it up. The end result from the shoulder and middle. 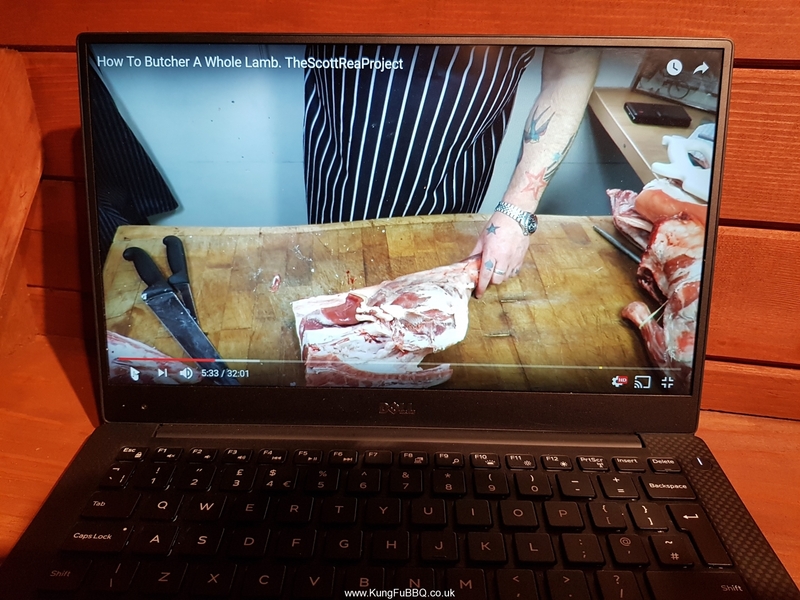 I was a bit nervous beforehand but I really enjoyed cutting the meat up and working my way through the steps in the video. Felt like a great achievement at the end! I would do it again for sure and quite fancy having a go at butchering a pig now. I am an absolute beginner to this so there might be mistakes in my terminology above, if anyone spots any howlers please drop me a note on Twitter and I will correct it!